Happy Wednesday! I hope you all are ready for the holiday tomorrow! I still have a ton of errands to run AND I need to make a homemade pie (our family is having a ‘best homemade pie’ contest) if any of you have a yummy pie recipe, or a filling idea you want to share I would LOVE any help I can get! Today I’m sharing a look I wore a few Sundays ago. I love the bold red paired with the soft grey SJP pumps and sweater (and how cute is my furry accessory/photo bomber, he loves to tag along while Drew and I take photos). Gorgeous look. Love red + grey together! This is a lovely mix that era;;y allows both the red and gray to shine! Love the contrast between the neutral grey and that gorgeous red. And the lipstick tops it off perfectly! Good luck with the homemade pie competition – salted caramel apple pie is divine! Absolutely gorgeous Rach!!! Stunning skirt! I am in love with those SJP pumps! Thanks for the reminder they’re now in stores! You look fantastic in midi-skirts!!! Beautiful! Love the cute skirt and the heels! This is such a lovely look! That bold skirt is perfect for this holiday weekend! Good luck with your pies! Love this outfit! I’m all about midi skirts right now and this combo is fab! Thank you so much! I’m going to check it out now! I love that skirt and those heels paired together! Such a gorgeous, festive look! I love the skirt!!! beautiful!! and your dog is adorable!! he is so cute! Red is def. your colour! You look stunning in this feminine outfit! Beautiful skirt! Looks amazing on you! I LOVE those soft gray pumps! Such a pretty neutral shade! And that red midi skirt is so feminine and flattering! Love the pale gray color of those heels, they look lovely. I love a simple holiday look this would be so great for a simple holiday office party! Love this!! Those shoes are so beautiful!! Love!!! Gorgeous look! I love the Bold Red and Soft Gray! It creates the perfect contrast! Happy Thanksgiving! I love how vibrant the skirt is! I love the red skirt! So pretty. I also love how you let it stand out by pairing it with gray. you wear red so well! love the gray pumps too. Red always looks great on you! I’m making sweet potato pie with a pecan and marshmallow topping! This combination is perfection! Love love love the soft grey against the bold red!! Beauty! Obsessed with everything about this! Love, love the pop of red! That skirt is gorgeous! I love the color and it goes so well with those shoes. Great look! Love the puppy photo bombing. So cute! Where are sunglasses from? Love it! This is a beautiful midi skirt, really reminds me of the holidays! Love this classic look! You always look fab in red. Hey Rachel, love the mix of soft and bold hues! I have never tried at a homemade pie, but best of luck :). Love that color combo, great little pop of bright color! My family enjoys making a chocolate pie with meringue and chocolate chips on top,they also make a butterscotch pie with meringue and butterscotch chips on top (both my late grandma’s recipe) Both are to die for! My brother and I still fight over it till this day! Love the outfit..beautiful! And your baby is such a cute photo bomber! Happy Thanksgiving! I have the best homemade apple pie recipe from my sweet Grandma, it’s been in the family for years and it is hands down the best, most simple apple pie! Super easy to make too. I love your blog, and hope you find this recipe helpful and maybe even use it. * cut shortening into flour and salt mixture, then add T of cold water one at a time and form into two balls. Roll out to make top and bottom layer of pie. Bake @ 400 degrees for 1 hour and 10 mins, let cool for 30 mins. Thank you SO much for the recipe!! This sounds amazing! Drew loves apple pie, I’m definitely going to have to use this. Forgot to add that it’s 1/4 tsp of salt for the apple pie filling mixture. Hope you enjoy! Happy Thanksgiving. Looking gorgeous! Love this red skirt! The effect of a red skirt into an outfit is always impressing! great and simple color combo. Please come check out my Thanksgiving outfits selection. Stunning! In terms of pie you can do four fillings instead of one by dividing the pie into four quarters, peach Apple pecan and cherry were always our family favorites! Gorgeous look! I love the red and gray color combination, they are very stunning together! 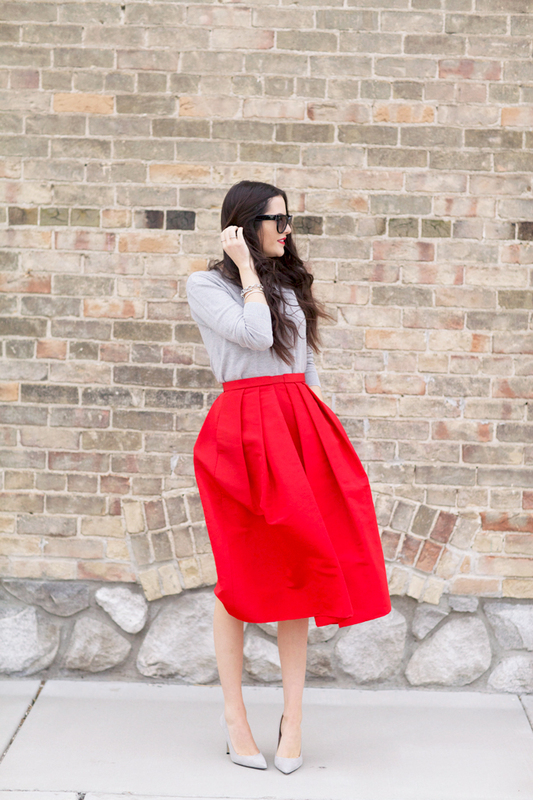 And the red midi skirt truly stands out in this look. Great look Rachel! Love the soft grey pumps! 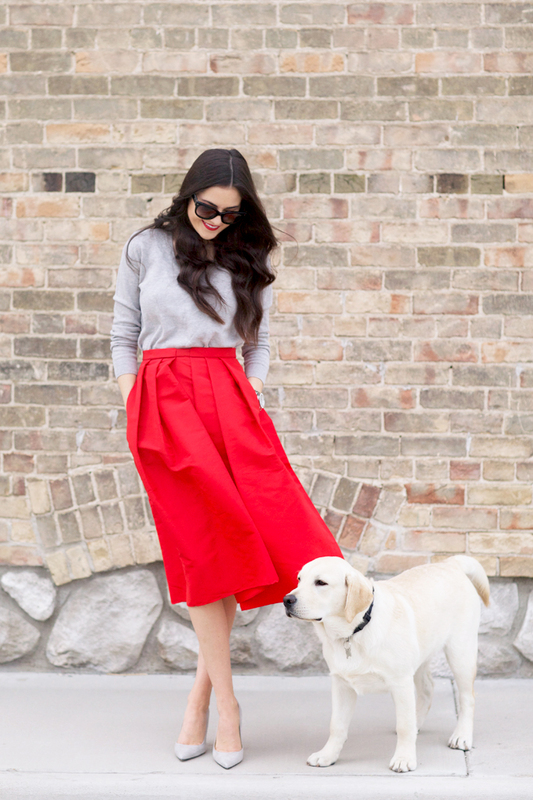 Is there anything better than a bright red midi skirt? I think not! Wow, that’s some bump you got going on in the second pic! Did I miss an announcement? You go girl!!! You are going to make the most beautiful baby. Love the shade of this red color. It is great to balance grey with red. Perfect for holiday season and still look light. Love that skirt! Coconut cream is my all time favorite pie! Good luck! This is my favorite pie in the whole world. My mother has perfected it. An apt way to describe your outfit indeed! Awesome outfit! The shoes are so fab! My go to dessert is an easy one, chocolate cake, chocolate pudding, Heath Bar (crumbled up) and Kahlua- I would make it as a truffle- and you can put whipped cream in between the layers and the layer with the cake put a little bit of the Kahlua on it. The top layer should be the whipped cream with the broken up bits of Heath Bar. I made this when my husband and I were dating- and all of his friends devoured it! Happy Thanksgiving! I hope you win! Oh my goodness those shoes! Lovely color combo! You always have such beautiful color combinations I wouldn’t have thought to put together. Happy Thanksgiving to you and your family!! What a great colour red! Best of luck with the pie making, I’m sure whatever you decide on will be lovely, I’m a bit of a plain jane though, so a really good apple pie with cinnamon suits me down to the ground!! I am obsessed with this skirt. You look gorgeous. The skirt is stunning.I love it so much ! You combine really pretty the skirt. Congratulations!!!! This is so exciting! You look gorgeous!! You look gorgeous! I love this skirt! You look beautiful, I love that skirt! The red just pops in this look. I do love that skirt! The whole outfit is so wearable but the red of the skirt really makes it stand out.